I’ve spent the past couple of days working to reclaim an area of our yard I call The Ledge. This is where the original slope had been cut into in order to create a flat spot for a driveway and the mobile home that was our abode while we saved up the money to build a real house. A steep embankment rises from a narrow driveway to meet the original mountain slope. When we moved in, this area was grass dotted with azalea bushes, hollys and rock-rimmed flower beds. When we moved into the new house and the trailer became my workshop, keeping this area trimmed and neat took on a lower priority and the forest reclaimed it quickly. Getting it back has been on my to-do list for some time. I went in with weed-eater, brush cutter and a lopper. I made a lot of noise to scare off any snakes, and worked slowly to give them time to slither away – if they were there at all; I didn’t see any. I battled a man eating rose bush. I fought with hellish honeysuckle vines. I clogged the weed-eater head several times. I whacked and cut and sawed most everything I encountered, and pitched the offal over the edge to the drive below. Later I spent hours gathering it up, dragging it off and stacking it on a brush pile. If we ever buy a chipper-shredder I’ll make enough mulch to cover half the county. I cleared a good foothold the full length of The Ledge. I’ll need to consult with Marie on which of these bushes are azaleas and which are junk. Those worth keeping will get trimmed back to bush size and allowed to remain, the others: hack – chop – haul. I am merciless! I now have a staging area where I can press further up the slope to clear the brush. I’ll need the chainsaw to remove the smaller trees. 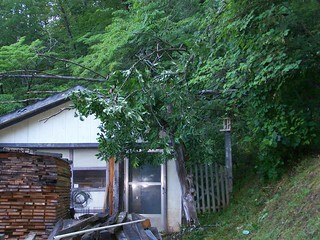 The mature live trees can stay, the dead ones must come down before they fall down and smoosh my shop. As I headed for the shower yesterday evening, I was quite proud of the progress I’d made. This morning I walked over from the house and discovered that I’d been counter-attacked. Two fairly good sized trees had fallen on the roof of my lumber shed. Shattered dead branches are scattered everywhere. One punched a hole in the tarp covering Cochise’s pen (opposite side of the shed). I can fix that. The rest is going to take a full day and at least one helper to cut up and haul away. I’ll be picking up branch-bits for days before I dare mow again. Payback? (raises one eyebrow) Maybe! Allan, Oh my gosh, a bear. Well, at least that's not one animal that I have to contend with at my garden. The largest animal that I've seen at my garden is a deer and they are pretty non aggressive. I'm so sorry to hear about the loss of your dog. Has anyone called animal control. Bears are kind of scary. They are very unpredictable. I'm not sure about how you keep a bear out of the garden. They can go just about any where they want. Where do you live again? I've not heard of bears anywhere in Nebraska. Our threat is cats. We have panthers and mountain lions but not so much around the city. Although, they did kill a mountain lion in the middle of the city where I live a couple years ago. I hope the bear wanders back to where it came from and no other harm to pets will result. Have the best bear free day that you can. Thanks for the encouragement, Dave. First a spiteful forest, now a bear has taken up residence just up the slope from this area. It's killed one of our dogs already (the others are being kept penned) and it was found peering through the living room window of my nearest neighbor. Makes those long walks in the woods a little bit daunting! Allan, you go guy. It does give a good satisfaction to see progress when cleaning up a disaster area, doesn't it. Keep up the good work. I can't believe the trees tried to strike back. :0) Have a great clean up day.